Most New York State and Local Retirement System (NYSLRS) members contribute a percentage of their gross earnings to the New York State Common Retirement Fund (Fund). These member contributions, in addition to employer contributions and investment earnings, help make sure the Fund stays well-funded to support the retirement benefits earned by members and retirees. Your tier and retirement plan determine if you must contribute and what percentage of your earnings you contribute. At NYSLRS, there are two types of member contributions: required and voluntary. If you belong to a retirement plan with required contributions, you must make member contributions for the length of time stated in your retirement plan. If you make voluntary contributions, you belong to a retirement plan where you don’t have to make contributions, but you can volunteer to make contributions. Most ERS Tier 1 and 2 members are not required to contribute, but may contribute voluntarily. ERS Tier 1 and 2 members receive an annuity based on their voluntary contribution balance in addition to their pension at retirement. All ERS Tier 3 and 4 members are required to contribute 3 percent of their gross earnings until they’ve been NYSLRS members for ten years, or have ten years of service credit (whichever comes first). ERS Tier 5 members are required to contribute 3 percent of their gross earnings for their entire career. ERS Tier 6 members are required to contribute for their entire career a specific percentage of their earnings based on their salary. 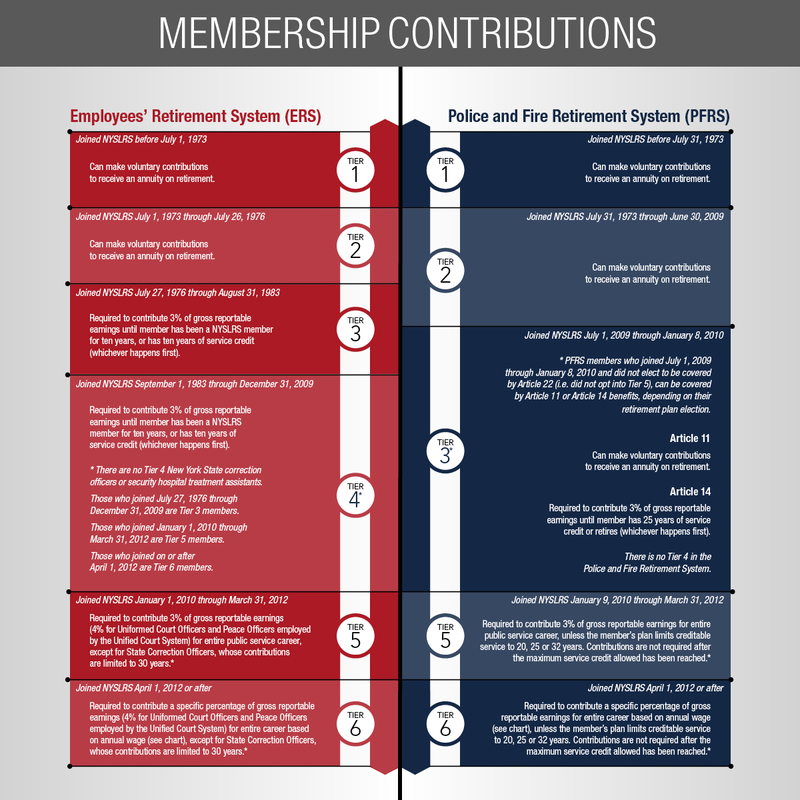 Though most ERS Tier 5 and Tier 6 members are required to contribute for all their years of service, the contributions of State Correction Officers in these tiers are limited to 30 years of service. ERS Tier 5 Uniformed Court Officers and Peace Officers employed by the Unified Court System must contribute 4 percent of their salary for all their years of public service. Most PFRS Tier 1 and Tier 2 members, as well as PFRS Tier 3 (Article 11) members, are not required to contribute, but may contribute voluntarily. PFRS Tier 3 (Article 14) members must contribute 3 percent of their gross reportable earnings for 25 years or until retirement (whichever comes first). PFRS Tier 6 members are required to contribute a specific percentage of their earnings based on their salary for their entire career. 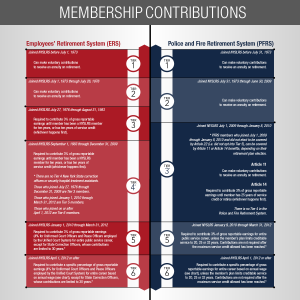 Though most PFRS Tier 5 members must contribute 3 percent of their gross reportable earnings for all their years of public service, PFRS Tier 5 members enrolled in a retirement plan limiting the amount of creditable service they may accrue will not be required to contribute once they reach the maximum amount of service allowed by their plan. If a union-negotiated collective bargaining agreement in effect on January 9, 2010 required an employer to offer a 20- or 25-year plan, any new employees who join while that agreement is in place will not have to contribute. Content last revised November 26, 2014. 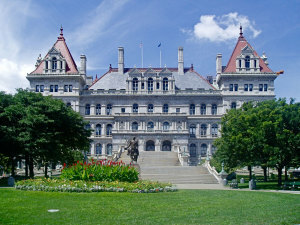 This entry was posted in General News, Members and tagged Contributions, defined benefit plan, defined benefit plans, ERS, members, New York State & Local Retirement System, New York State Common Retirement Fund, NYSLRS, Pension System, PFRS, The Fund, well funded on November 26, 2014 by NYSLRS. As an elected or appointed official, the time you work for your public employer gets reported to us as paid service, and we use that data to determine your service credit towards retirement. However, some elected and appointed officials usually don’t work a fixed schedule or have preset hours like other NYSLRS members, so determining the time they’ve worked is a little bit more involved. In recognition of Election Day and the new terms and appointments that will result of it, let’s take a look at the member responsibilities of our elected and appointed officials. Elected and appointed officials have been required to record and submit a record of work-related activities (ROA) to their employers since 1976. The ROA is a daily detail of hours worked and duties performed by the official, including official duties performed outside normal business hours. Activities can include attending an employer-sponsored event, addressing constituent concerns and responding to an emergency. Activities that would not be considered work-related include time attending electoral and campaign events, time spent socializing after town board meetings, attendance at a candidates forum, and on-call time. To help ensure that elected and appointed officials receive appropriate service credit, changes and additions to the process of reporting elected and appointed official went into effect in August 2009. Elected or appointed officials who do not participate in a time and attendance system that tracks or verifies their actual work hours now must prepare a record of their work-related activities for three consecutive months within 150 days of the start of a new term or appointment. The old requirements stated that elected and appointed officials only had to prepare a one-month ROA of time worked, or that they were required to submit their ROAs to a legislative body. Now they’re specifically required to submit the ROA to the clerk of the legislative body and others for their review. The ROA enables their employer to provide us with accurate information about the days they’ve worked so that their retirement service credit will be correct. Content last revised November 5, 2014. This entry was posted in General News, Pension System and tagged Elected & Appointed Officials, ERS, New York State & Local Retirement System, NYSLRS, public pension system, reporting on November 5, 2014 by NYSLRS.